The last Mr. Beer standard HME that I had not tried was the Linebacker Doppel Bock. I started plugging in ingredients starting with this HME trying to get to a DoppleBock color / bitterness / ABV, and this is what I came up with. This was on the high side ABV compared to most other beers I had attempted. At the time, only the Tweedle Beetle Stout ended up higher. 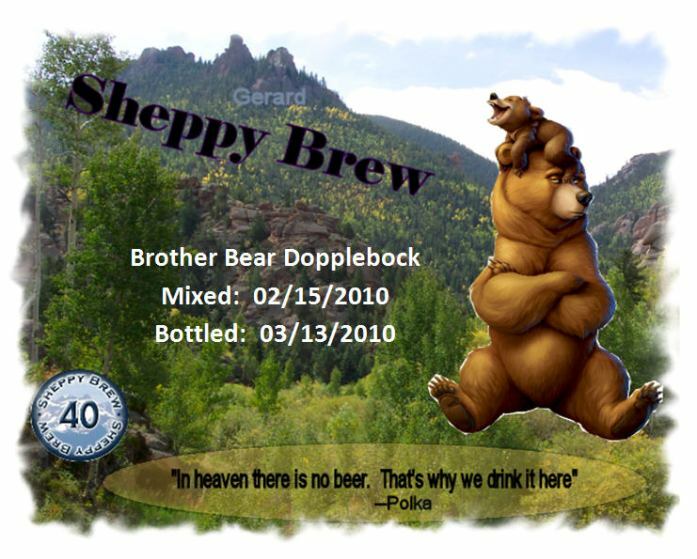 I've never really been a dobblebock drinker, so I was not absolutely sure what to expect. This was also my first lager. I was not 100% sure I could maintain lager temperatures for the whole fermentation cycle. It turned out pretty good even though we were in Illinois for a significant number of the days. The beer is low in both hop flavor and bitterness. The malty goodness is almost sweet, but does make for a pleasant beer drinking experience. Bring 1 gallon water to 155F. Add specialty grain in muslim sack to water and steep for 30 minutes. Remove grain sack and let drain into wort. Add DME and UME. Bring wort to boil and add hops. Boil for 25 minutes. Add sugar during last 5 minutes of the boil. After the boil, remove from heat and add HME to the wort. Cool in ice bath to less than 80F, and then add to fermenter. Top off with water to 8.5 liters. Aerate and pitch yeast as usual. Batch prime with 2.00 oz table sugar. 02/15/2010 Mon Brewed this up. Didn't notice until I actually was working through the brew sheet that I had told Beer Smith not to add the Mr. Beer UME until after the boil. Not sure why I did that, but to keep the same bitterness, I kept it as was specified. Its not something that my little htm export takes into account. I also had the 60 minute boil specified. Again, kept it as was. Used Irish moss and yeast nutrient even though was not in my recipe. Between the time I added the yn and the end of the boil, I left the pot unwatched and almost got a boil-over. Caught it in time, though. Cooled the wort in the snow in the backyard, which did not work as well as my usual ice bath, so I guess I will not be doing that anymore. Pitched at about 66 and hope to rapidly cool to the 50s. Measured OG at 1.076 adjusted for temp. 02/16/2010 Tues I've been tracking the temps using a digit meat thermometer taped to the side of the keg starting at about 10 late night. In the morning, I had 3 points so far 55, 53.7, and 54.9, so things are pretty consistent so far. There is a huge layer of kraussen on the top and the yeasts were moving around. Came home from work with 52.6. Moved the ice bottle to far corner of cooler and by 21:00 the temp was back at 54.4. Kraussen was even bigger and thicker and the yeasties were just as active if not more so. Looks like overflow is possible, maybe even inevitable. 02/17/2010 Wed Temps today: 4:30--56.3 6:45--55.4 17:45--55.6. Still very active, although I think the kraussen may be a bit less today. 02/23/2010 Tues Well, the beer seemed to survive the weekend ok. Got back from the trip and checked the temperature immediately. Was at 56.7 added frozen water to cooler and temp this morning was at 56.9. No activity. 02/24/2010 Wed Mostly right around 55. Added Tweedle Beetle Ale to the conditioning cooler which will probably tend to heat up the cooler just a bit. 02/28/2010 Sun Removed Tuke from the cooler to allow beer to heat up for a "diacetyl rest" (and to make room for my next beer). Am pretty pleased with the temperature results of my first lager. Not sure I can recreate in the heat of the summer, but works well this time of year. 03/03/2010 Wed Not really heating up past 66 on the thermo strip. Have floaties in the the beer that are not flocculating. Have noticed with Stone Soup IDA that the taped on digital thermometer seems to measure colder that the strip. Not sure if that means the digital thermo is reading cold or the strip is inaccurate. My guess is that the digital thermometer is not as accurate as I had assumed, which means this beer probably fermented a bit warmer than I thought.